To conduct repair on the inner wall of the CFM-56-7B thrust reverser, SR Technics builds special tools and jigs for laying up repair patches and doublers. The height of this jig is 110 cm, length is 185 cm and width is 185 cm. As part of composite repair training, Abaris instructors help students assess, repair and inspect CFRP laminate structure such as this 11 mm thick section with 7 mm-thick integral blade stiffeners. In the next 20 years, commercial air traffic is expected to double, along with the global fleet of 100+ seat passenger aircraft, which will increase to more than 30 000 planes. This prediction is made in the latest global market forecast from Airbus, the OEM based in Toulouse, France, that builds two models of next-generation commercial passenger aircraft: the A380 (maximum passenger seating at 853) and the A350 XWB (440 passenger max). Both planes reflect the evolution of composites onboard Airbus aircraft, at 25% by weight on the A380, escalated to 53% in the A350. Also weighing in at 50% composites by weight is US-based Airbus competitor, Boeing, with its 300-passenger, next-generation 787 Dreamliner. Clearly the past is prologue for the success of composites on these aircraft in terms of at least 40 years of proven weight savings and fuel efficiency benefits from traditional glass and aramid reinforced polymers, hybridisation of glass (GRP) and carbon fibre reinforced plastics (CFRP), composites combined with metal alloys, and now in a greater proliferation of CFRP. Toray’s TORAYCA® prepreg is single sourced for 787 primary structures, while Hexcel prepreg is single sourced for A350 primary structures. 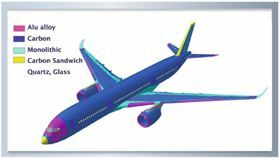 On the A380, Toray and Toho Tenax carbon fibres are used in prepreg from both Hexcel and Cytec, along with thermoplastic composites from Toho Tenax and TenCate. Safety, performance and cost savings have also been delivered through composite components on previous aircraft, sufficient to convince OEMs that advanced composites in next-gen aircraft will provide significant maintenance savings. 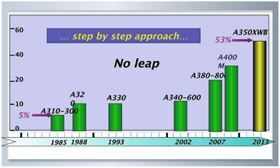 Thevenin cites the step-by-step approach taken by Airbus with composites, tracking from GRP fairings on the A300 in 1972 to 5% composites by weight on the A310-300, 10% on the A320 family, 11% on the A330/A340 family and on to the higher percentages already cited for the A380 and A350. For its 787, Boeing expects a 20-30% saving in maintenance costs. The OEM just delivered the first Dreamliner in September to launch customer All Nippon Airways (ANA). The 787 also features an extension of its first scheduled D-check at the 12-year mark. Further, Boeing believes maintenance costs after the 787’s design service objective (DSO), which typically increase as aircraft age, will remain fairly stable. While next-gen aircraft may encounter less overall maintenance in composite components, effective repair methods must be in place when damage occurs. Certainly four decades of practical experience in composite repair by airline operators and maintenance, repair and overhaul (MRO) companies have established baseline methods to restore original safety and performance standards. However, the designs of new commercial aircraft will offer some unique changes that could affect the materials, tools, inspection equipment and training required to repair them. 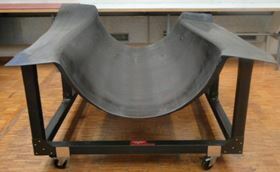 In particular, CFRP components in primary structure on the A380, A350 XWB and 787 are made with considerably thicker, monolithic laminate, estimated at up to 150 plies thick. 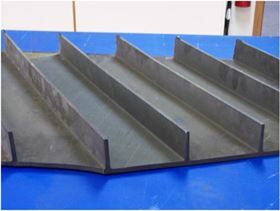 Other design changes involve multiple parts integration into larger, single piece components with complex contours, and bonded spars/stiffeners that were previously mechanically fastened. 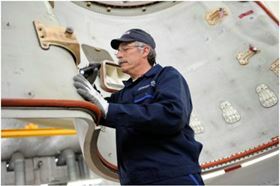 Further, manufacturing methods for next-generation aircraft have changed, involving automated fibre placement and tape laying. This includes bolted repairs of metal or prepreg patches to thick, monolithic primary structure, as well as bonded repairs. Thevenin points out that “bolted repairs are in principle similar to what is required for metallic structures and are the only ones applicable for structural repairs to restore ultimate load capability.” Bonded repairs, he states, could be used for structural repairs only if they could fulfill the fail safe requirements of patch off/load limit capability. Currently, bonded repairs are only applicable to sandwich structure (skins over core). On the A380, new CFRP monolithic laminates are used in the entire rear fuselage, centre wing box, and select wing ribs, while the complete A350 fuselage encompasses large CFRP panels over a composite frame. “The thicker laminate by design prevents water ingress and offers a tremendous advantage for robustness,” Thevenin states. He adds that in-service experience by airlines over more than 150 million flight hours across all Airbus programmes has resulted in excellent feedback regarding the performance of composite monolithic structures. Certainly SR Technics is not new to handling and repairing composites or to Airbus and Boeing aircraft. The independent MRO based in Zurich, Switzerland, has 500 airline customers and currently services A310, A320 and A330/340 models, as well as Boeing 737s in its 350 000+ m2 of MRO facilities. The company is ready for composite repair to next-gen aircraft, according to Jurg Bislin, Vice President of Engineering and Planning. In Greensboro, North Carolina, USA, TIMCO Aviation Services is in its 21st year of operation, with both FAA Part 145 and EASA 145 certification. The privately-owned MRO employs over 1000 mechanics working within its 1.5 million ft2 of facility space on 737, 757, 767, 777, A300, A310, A320, DC10, and KC10 aircraft. The company established TIMCO LineCare services in 2010 at 21 US locations to conduct overnight line checks, transit checks, cabin refurbishment and on-call services. Jim Dinwiddie, Business Planner, reflects on the company’s composites repair experience regarding expectations for next-gen aircraft. As a frame of reference for the time involved to repair composite sandwich structure compared to thicker monolithic components, Dinwiddie describes one of the large repair types currently conducted by TIMCO, involving damage to CFRP flight controls. At the airlines and MROs, adequate composite-specific training of technicians who will gets hands on in conducting repairs is crucial. Inspectors must also be trained to recognise the particular reactions of composites to impact, which is much different than for metallic aircraft. Even refuellers and baggage handlers can help keep extra and informed ‘eyes on’ composites-intensive aircraft by reporting any impact incident, whether visual damage is obvious or not. Abaris Training, Reno, Nevada, USA, works with major OEMs and trains some 1000 mechanics, technicians, engineers and managers annually in the chemistry and material science of composites and to conduct and inspect repairs. Different repair approaches are being examined. Dorworth identifies one as “use of multi-angle or parabolic scarfing to reduce the amount of good structure removed in preparation for repair of thick monolithic structures. For CFRP inner blade stiffeners, bonded or bolted metallic or composite doublers may be used in lieu of scarf repairs.” Abaris is working closely with aircraft and repair equipment OEMs to develop new materials, processes and process control systems for next-gen composite repairs. Dorworth says most are proprietary, but certain technologies, such as micro-wire thermal sensors used to read temperatures deep inside thick laminates, show promise. Abaris leadership has long been involved in efforts to improve training for composites technicians, and Mike Hoke, company president, suggests additional training will be a plus to repair thick section CFRP components. OEMs also view composite training as vitally important, as Airbus’ Thevenin verifies. As with the lack of industry standards for composite training, so goes the dearth of repair materials standardisation, a fact known only too well by airline operators. Eric Chesmar is Principal Engineer of Composite Structures at the United Airlines Maintenance Base in San Francisco, California, USA. Chesmar expects only a small increase in composite repair with early introduction of new aircraft, and notes that Boeing has addressed issues of thicker laminate with extra steps in its hotbond prepreg repair techniques and training. United has invested in some additional tooling for the 787, but Ron Torres, Managing Director of Component Maintenance and a 30-year veteran with United Airlines, identifies the best tool available as the airline’s experienced and resourceful shop technicians and engineers. The team also developed special tooling and procedures in a dedicated work cell for sandwich constructed fan cowls (CFRP skins over aluminium core), which improved repair effectiveness on over 50 units/annually, right down to salvaging latches. “United’s composite repair professionals demonstrate every day as they face many challenges that there is no substitute for a great team,” Torres says. He suggests that adaptations for repair of next-generation aircraft composite components will involve not just tooling and equipment, but also managing the economics of material cost and the network to accommodate repair material availability – possibly through common sourcing among partners. AFI-KLM E&M already has operator customers for A380 aircraft and commercial contacts for future operators of the 787. It would seem that adaptation is an essential ingredient in bringing positive progress from past experience. Leonard Kazmerski, TIMCO’s Vice President of Marketing and Business Development, sees this trend in the design and maintenance of next-generation composites aircraft. This article was published in the November/December 2011 issue of Reinforced Plastics magazine. To apply to receive your free copy of each issue of Reinforced Plastics please complete the subscription form.